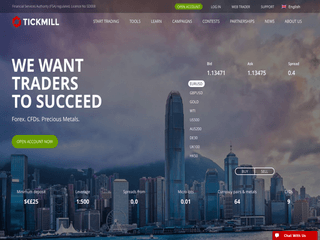 Tickmill’s heading revolves around the traders’ continuing success and that pretty much encapsulates what its creators believe in. For this reason, they are constantly enhancing their technology, infrastructure, and systems for customer management in order to safeguard a distinctive trading atmosphere. The incredibility talented and devoted team of professionals and experts all share the same aspirations and goals to turn the enterprise into the success it has already become. Tickmill’s assiduous efforts have led it to deliver amazing services and products, as well as a superb customer support. Tickmill breathes innovation, so that’s why they are always on the lookout for things to improve and construct something which greatly benefits their clients. It is a new-fangled method of trading with extremely low market spreads, true DMA and STP, innovative trading technologies, no requotes, and absolute transparency. With over 80 instruments for trading, no fees neither on deposits nor on withdrawals, and fully segregated accounts, Tickmill is really an exceptional Forex brokerage. Awarded by the industry, it is stringently regulated by the Financial Conduct Authority (FCA), as well as by the financial authority of the Seychelles – FSA. Tickmill’s choice of three (3) trading accounts, as well as an Islamic account, is well-tailored to the fastidious needs of its keen investors – irrespective of their trading expertise. For newbie clients, Tickmill has devised a Classic account whose minimum deposit is to the tune of $25. Classic account’s spreads start from 1.6 pips. There are zero commissions, 0.3 seconds average execution speed, and Margin Call and Stop Out levels of 100% and 30%. The account can be launched in USD, EUR, PLN, and GBP. For investors who would like a professional advantage, the ECN Pro account is the wisest selection. Its minimum deposit is set to $25. In addition, spreads commence as low as 0.0 pips, only $2 are paid per side per lot, 100% and 30% are the levels for Margin Call and Stop Out, and 0.3 seconds is the average speed for execution. USD, GBP, PLN, and EUR are the supported currencies for this account. For big clients with a more personalised approach, Tickmill has crafted the VIP account. Its minimum deposit is a whopping $50,000. With the VIP account, you will be asked to pay $1.6 per lot per side which makes it one of the lowest commissions worldwide. Bear in mind that the more you trade, the smaller the commission will become. The Stop Out and Margin Call levels are 30% and 100% respectively while the average speed for execution is only 0.3 seconds. All accounts at Tickmill are swap-free, have a minimum of 0.01 lots, possess the option to initiate a demonstration account, and their max leverage is up to 500:1. The MetaTrader4 of Tickmill is entirely customisable and has been designed to provide investors with an edge in trading. MT4 is broadly considered the world’s most preferred platform for Forex trading since it offers a user interface that is simple to use, has innumerable indicators and charts, and, above all, the MT4 supports an MQL language, which permits you to easily program Expert Advisors (EAs) and indicators. These are fully automated trading strategies that can trade 24/5 on the Forex market and no human intervention is required from your side. Tickmill’s MT4’s key features are micro lots, EA trading facilities, no partial fills, and CFDs not only on Forex and commodities but also on stock indices. The WebTrader at Tickmill necessitates no downloading nor installation. Basically, it is the same as the MT4 platform but it is readily accessible in your browser. MT4 Web Platform’s benefits include one-click trading, encrypted operations, and convenient interface. The WebTrader’s key features are 9 chart timeframes, real-time quotes provided by Market Watch, basic objects for analysis (Fibonacci lines, equidistant channel, as well as horizontal, vertical, and trend line), and customisable price charts. The WebTrader of MT4 functions on any desktop platform as well as on iOS and Android mobile devices. Tmill UK Limited is authorised and sternly regulated by the Financial Conduct Authority (FCA) of the U.K. For extra hints of security, Tickmill Ltd is also regulated by the Seychelles’ regulatory entity – the Financial Services Authority (FSA). Compliant with FCA and FSA stipulations, Tickmill maintains investors’ cash on trust in completely segregated accounts. These funds are entirely isolated from the company’s own pecuniary means. As an additional and mightier security measure, Tickmill prides itself on being a member of the Financial Services Compensation Scheme (FSCS), meaning that U.K. customers are also shielded against default or insolvency of Tmill UK Limited. The scheme shields them up to the tune of £50,000.00. The nature and status of the claim define its eligibility. Nobody’s denying the importance of safety and security at a Forex brokerage. However, an undeniable fact of almost equal prominence is a company’s customer service. Not only Tickmill possesses a couple of live and demo data centres but it also provides client support, brimming with professionalism and attentiveness. It can be reached over the phone and via an e-mail and a live help. The chief command centre of Tickmill finds its place in London, the United Kingdom, and the website is accessible in English, Indonesian, Italian, Chinese, Russian, Spanish, and Polish. Tickmill’s customers are always put at the forefront. For this reason, the Forex enterprise does not charge any fees for withdrawals whatsoever. In addition to that, all deposits that commence from $5,000 or equivalent and are processed in one wire transfer transaction will also be exempt from a fee – in line with Tickmill’s zero fees policy. What’s more, the company covers differences and transaction charges for up to $100. All you have to do is e-mail a bank statement copy or a copy of any other document to the support team within one month of the deposit, and they will compensate you. Payments at Tickmill is made through Bank Transfer, FasaPay, Skrill, China UnionPay, VISA and MasterCard, NETELLER, and Dotpay. Deposits through credit cards, Skrill, China UnionPay, NETELLER, and Dotpay are instant while Fasapay needs 1-2 hours. All withdrawals are usually processed within one (1) working day. The supported currencies at Tickmill are USD, EUR, PLN, CNY, GBP, and IDR. Pampering its clients is a policy at Tickmill. In this regard, it has designed several ways of doing that. To begin with, traders can derive great benefit from a Forex Demo Race contest which yields up to $200 per week. Keep in mind that it is only accessible for customers of Tickmill Ltd. as it is FSA regulated. If you happen to be a trader of the month, you will go home with a $1,000 prize (available once a month). The NFP Machine of Tickmill permits traders to guess the price of a random instrument during the NFP week and they need to determine its price. Perfect guess brings $500 while the closest prediction will be bestowed with $200.